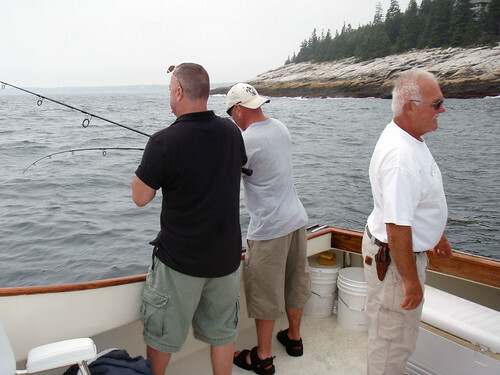 Monday afternoon I hopped on a striper fishing charter out of Boothbay Harbor, Maine. 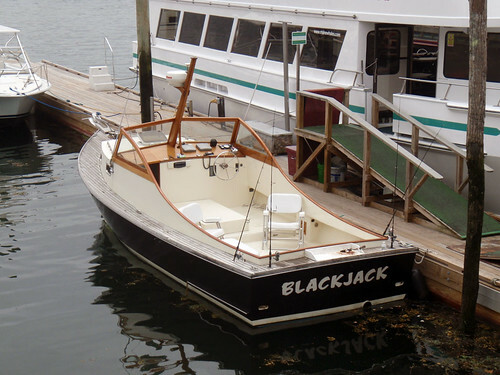 I went with Captain Dan Stevens and his 28 foot boat, the Blackjack. The fog was thick as we left Boothbay. We made a short stop to jig for a few mackerel to use as bait. 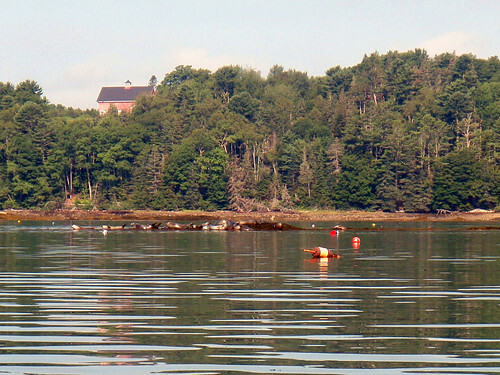 We headed west across Sheepscot bay past the mouth of the Kennebec River to the Popham Beach area. We passed a small island with dozens of seals hauled out. We finally arrived at our fishing spot. 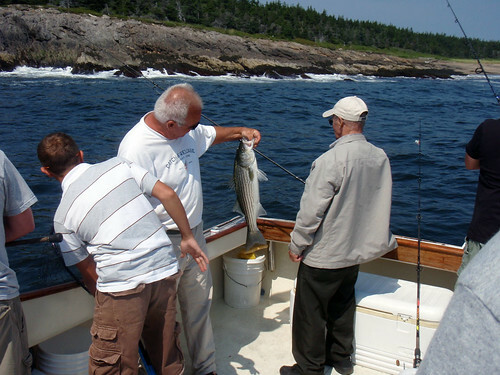 It was not long before we started landing stripers. 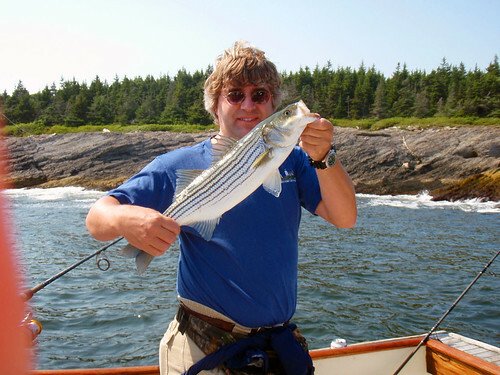 I was one of the lucky ones and landed a 22 inch striper. The trip back was better since the fog had lifted. I was able to see a few area lighthouses. 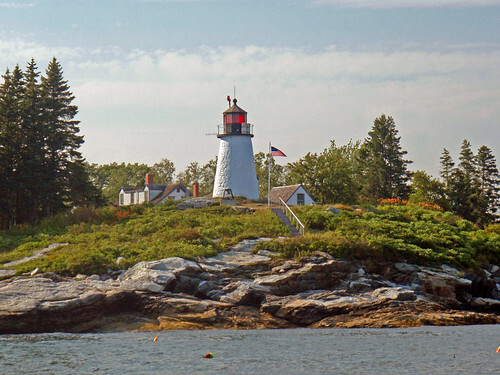 The fist one is Seguin Island Lighthouse near Popham Beach. 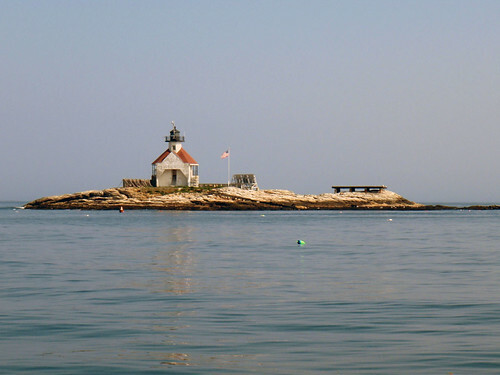 Captain Dan said it was the highest lighthouse on the east coast with a focal plane of 186 feet. 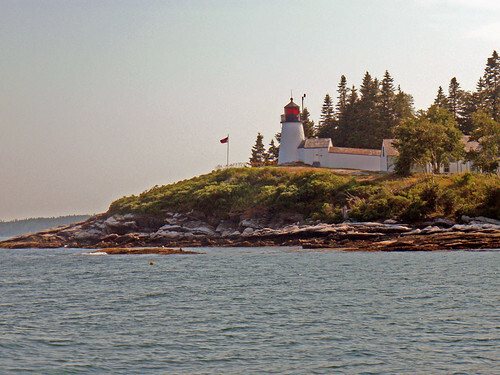 Next we passed Pond Island Lighthouse, also near Popham Beach. 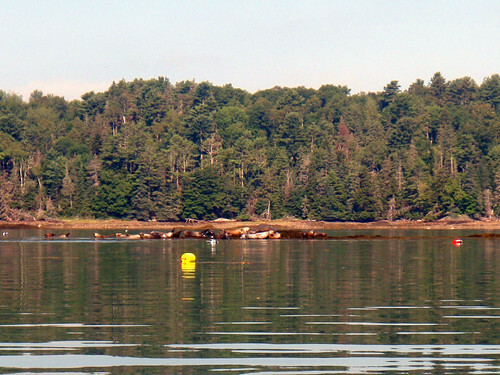 As we got closer to Boothbay Harbor we passed Cuckolds Light. We passed very close to Burnt Island Lighthouse so I was able to get some great shots. Overall it was a fantastic afternoon on the water. 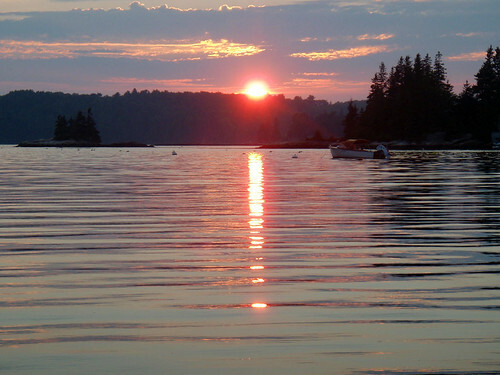 I am back in Bristol, Maine this week, for what could be one of the last trips. I hope to get some good days for kayaking, photography and perhaps some fishing this year. Good photographs are even more important this year for preserving memories. I arrived Friday evening and the place was socked in with fog. It had cleared out by Saturday morning and I was able to get out on the water. 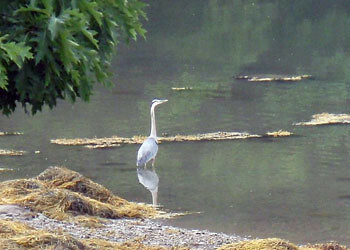 Before I even left I soptted a Great Blue Heron feeding in the cove next to the deck. Several lobster boats were checking their traps as I made my way towards the far side of the Johns River. 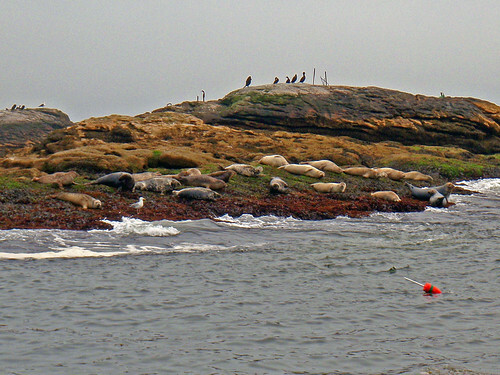 The seals were hauled out enjoying the sun. This time of the year they are still pupping and moutling so they are hauled out more time than normal. I could not get too close as they are pretty skittish this time of the year. I was surrounded by a group of swimming seals most of the trip. They kept pretty good taps on me and played games as I paddled along. I came off the water for the hot part of the day and waited until evening for a short sunset trip. 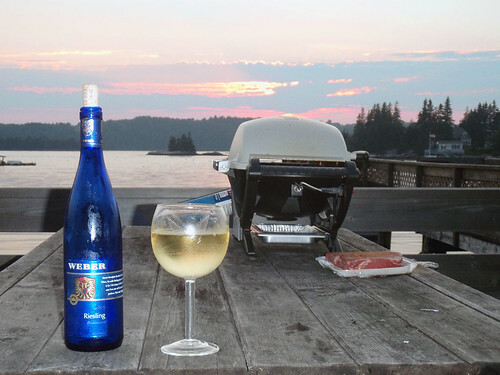 I was treated to another fantastic Maine sunset as dinner was cooking. 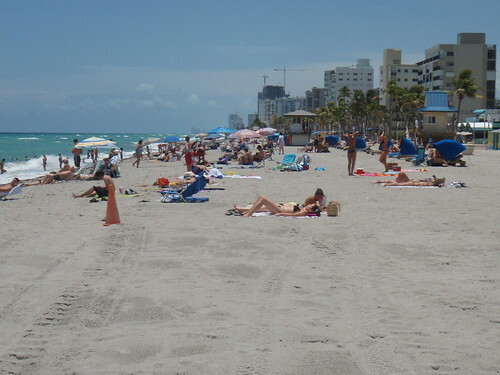 I had often thought about a Florida beach vacation in the Ft. Lauderdale area. I had some time to kill before my flight home on Monday and decided to check out an area beach. I wanted to get an idea what I could expect while on vacation. 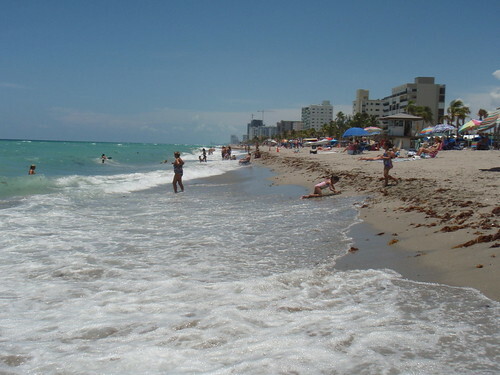 I headed south from the airport towards Hollywood along route 1 then cut over to A1A and North Ocean Drive. I found myself in an area named Dania Beach. The hard part was figuring out where I could park. Most of the parking spots had meters, making me wish I had more change. It was an interesting area with older non-chain hotels. The walkway and bike path along the beach was lined with restaurants, ice cream shops, and stores and bike rental shops. I got photos looking south (above) towards Hollywood and Miami and one looking north towards Port Everglades. I did not plan on doing any deep dives during this trip but changed my mind on Friday when I learned there was a Saturday (July 5th) morning trip to the Spiegel Grove and conditions were pretty good. I was a little nervous since I had to abort the dive during my 2005 trip. 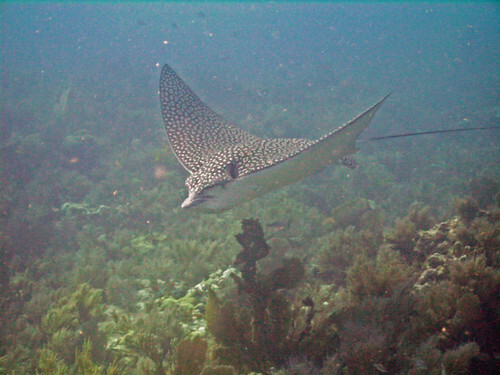 In 2007 I decided not to go due to dive conditions so it was a dive that was long overdue. I decided not to bring my camera so I could focus on safety since this was my first time at the wreck. Chris from Rainbow Reef was the dive guide for the trip. The waves were higher than I liked, which made me a little nervous. High waves make it difficult since you pull yourself around the boat to the mooring line along along a “granny” line while breathing through your snorkel. 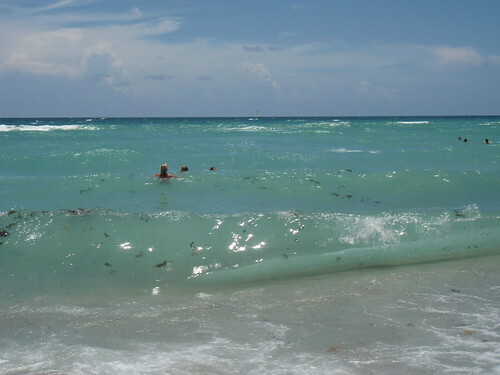 As I learned the hard way in 2005, water getting in your snorkel from high waves can be a problem. I made it with no problem but I still want to get a snorkel with a better wave guard for future dives like the Spiegel. 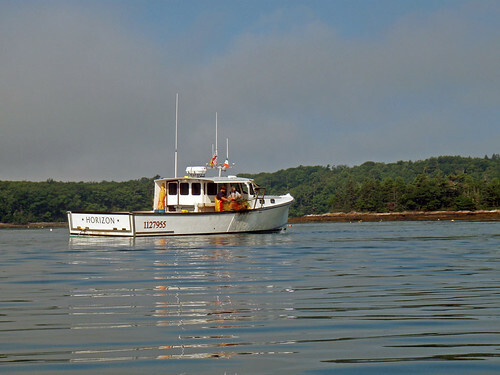 We moored on ball number three, which put us mid-ship on the starboard side at about 85 feet. There was very little current and visibility was great. We swam towards the bow past the mid-ship crane. We even stopped to salute the flag on the crane tower, which seemed like the thing to do since it was the 4th of July weekend. We turned around at the starboard anti-aircraft gun when I hit 1800 psi and headed back to the mooring line. 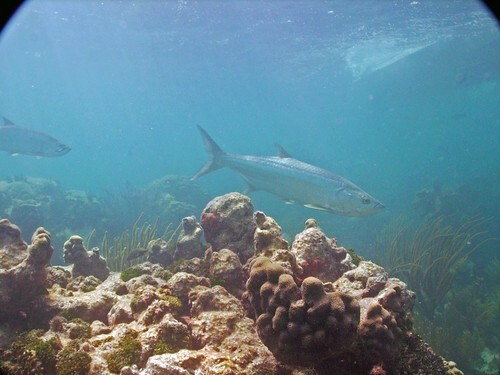 We did not see a lot of the large fish that hang out around the ship except for two pretty good sized Barracuda. As we planned, I ended up hitting 95 feet for my maximum depth. Overall the dive went as planned and I feel a lot better about doing more of the deep wreck dives in the Key Largo area, especially if I have a better snorkel. Forth of July 2008 is one I will never forget! 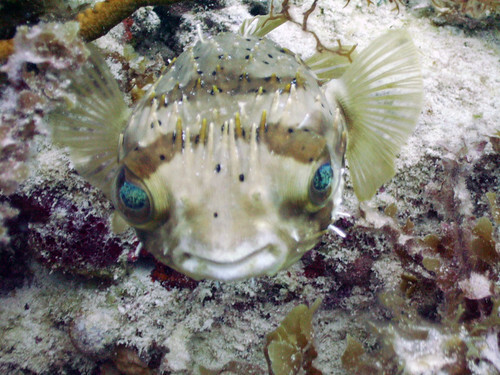 Diving out of Islamorada was great but I was glad to be back on Molasses Reef. 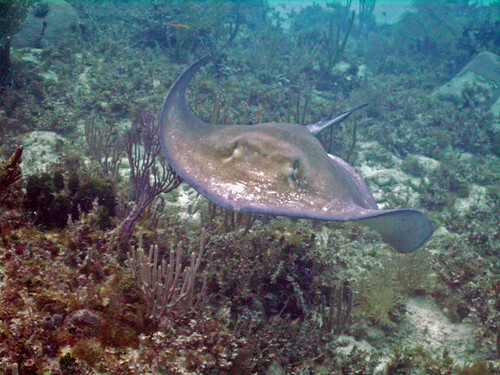 Visibility was fantastic and we had many sea life sightings. 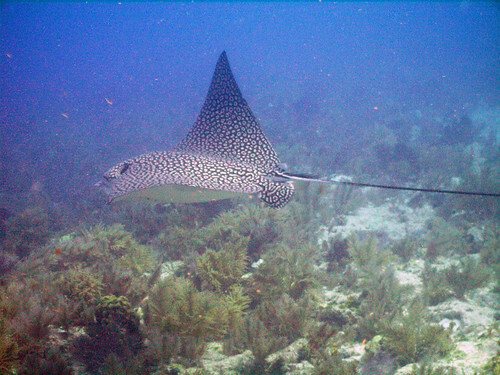 We saw more Spotted Eagle Rays and several sharks including a Black Tip Reef shark. 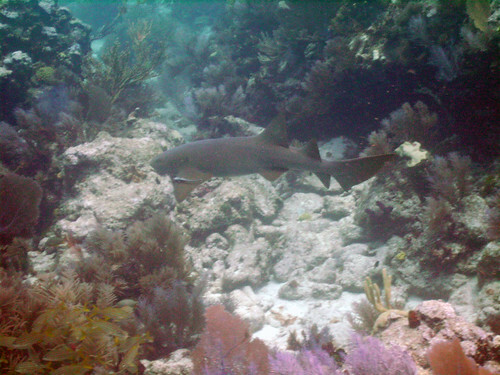 We also saw a couple nurse sharks and I was lucky enough to get close enough at the right angle for some good photos. I used up a lot of air chasing all those eagle rays and sharks so I hung out under the boat while the others were chasing a turtle. 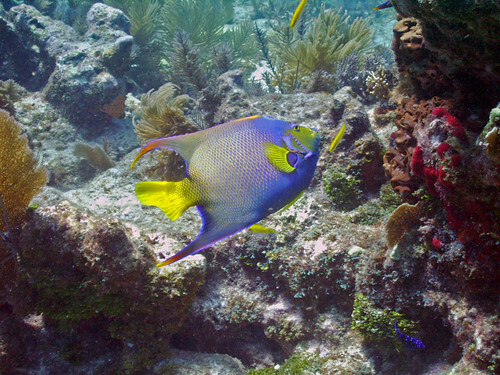 I was able to get a nice photo of a Nassau Grouper and a Queen Angelfish. It looks like this one got part of its tail bit off. 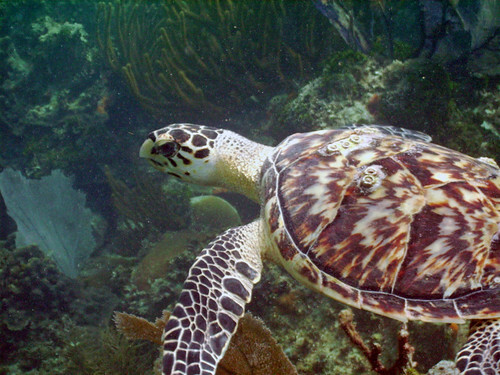 We dove out of Islamorada on Thursday, July 3rd and spent the day at Hens and Chickens reef. 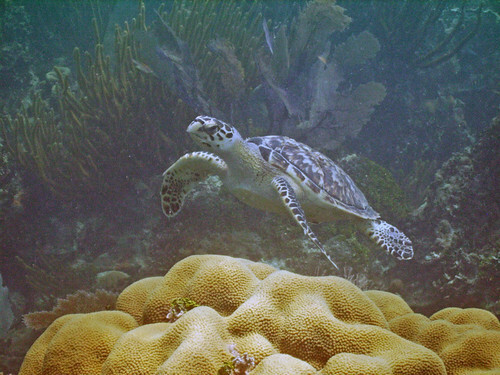 It’s a shallow reef with some great coral profiles and lots of sea life. 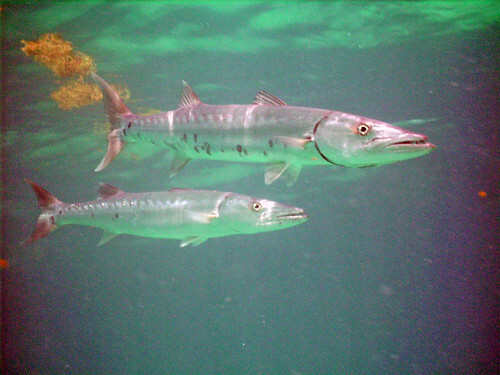 I was able to get a nice close-up of these barracuda near the surface. 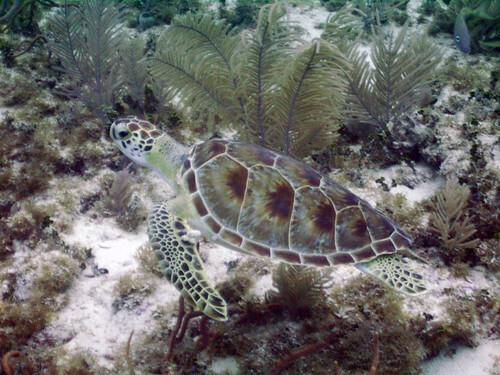 The big treat was another close encounter with a green sea turtle. We had been seeing several large Tarpon crusing the area but I was having a hard time getting a good photo. I managed to get this shot just before the battery in my camera died. 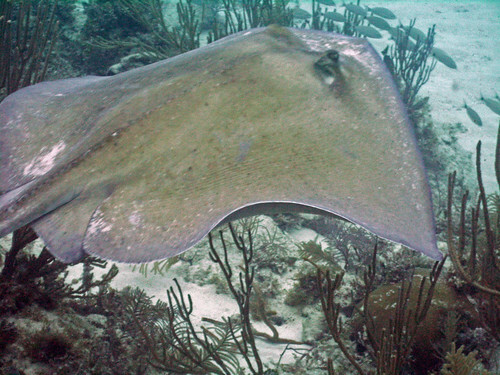 Today was my first dive trip out of Islamorada, which is about 20 miles south of Key Largo. Doing more dives down there was one of my goals for this trip. It looks like I will be diving down there Thursday and Friday as well. 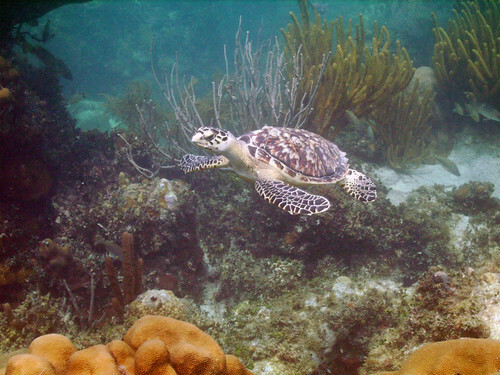 Most of these sites are outside the marine sanctuary and don’t have as many divers visiting. 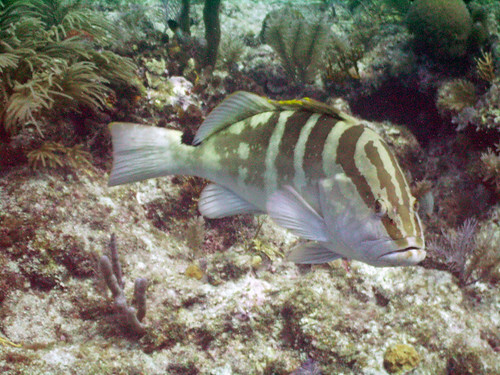 We visited two patch reefs this morning named Patch A and Grumpys. 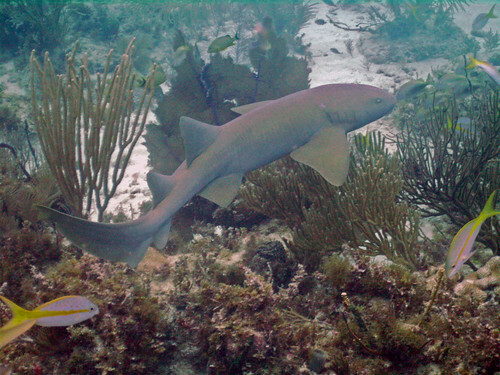 Patch A was a great environment for Nurse Sharks with many overhangs form them to hide under. 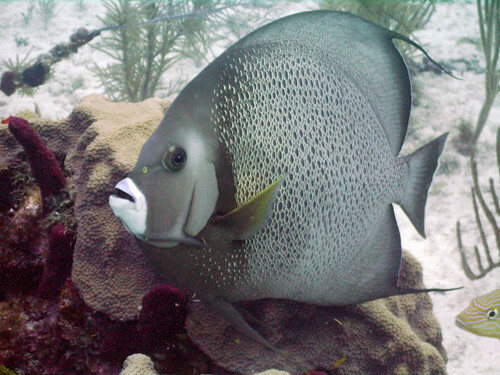 I also got this really good shot of a Gray Angelfish. For some reason, getting a good side profile of Anglefish has been difficult so I was really happy to get this one. I was also lucky enough to have a close encounter with a large Southern Stingray. 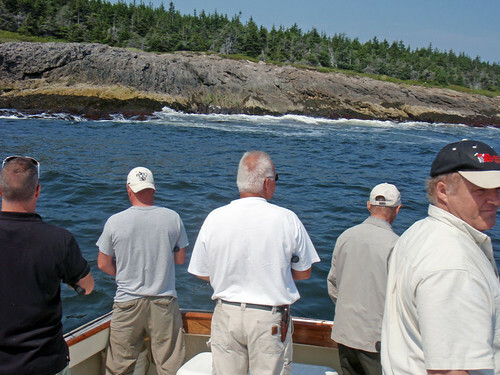 The dive site named Grumpies had many nooks and crannies, which made it a great place to find lobster. 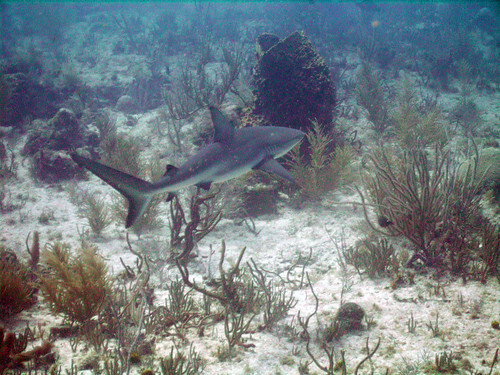 This also explains why Nurse Sharks also can be found in the area. 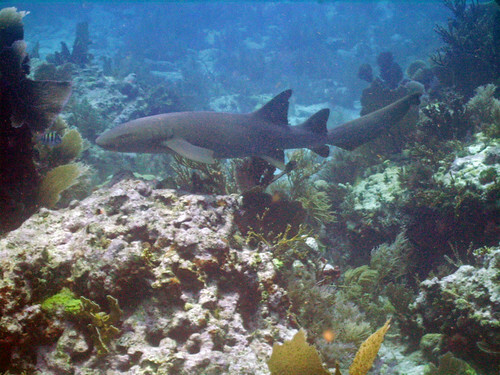 I was photographing a Nurse Shark in its “den” when it swam away. 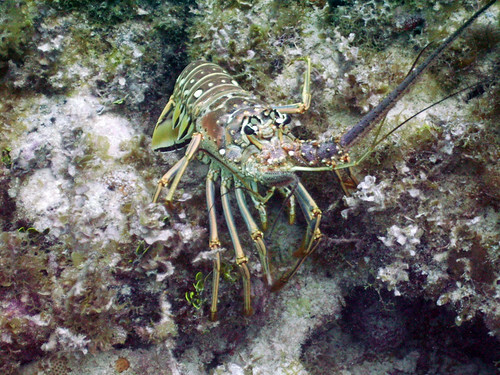 The den area was littered with the remains of several lobsters, telling me that Nurse Sharks like lobster as much as we do. 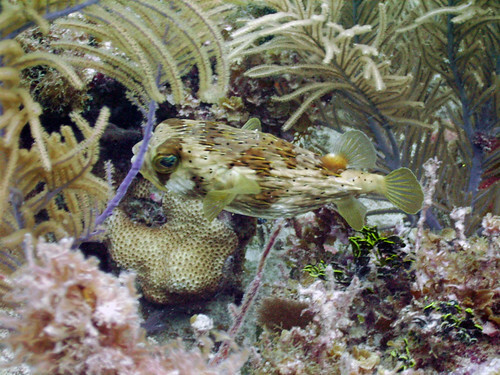 I also got a shot of this Balloonfish from an interesting angle.